Relational database management systems have been the traditional form of structured software storage for decades. 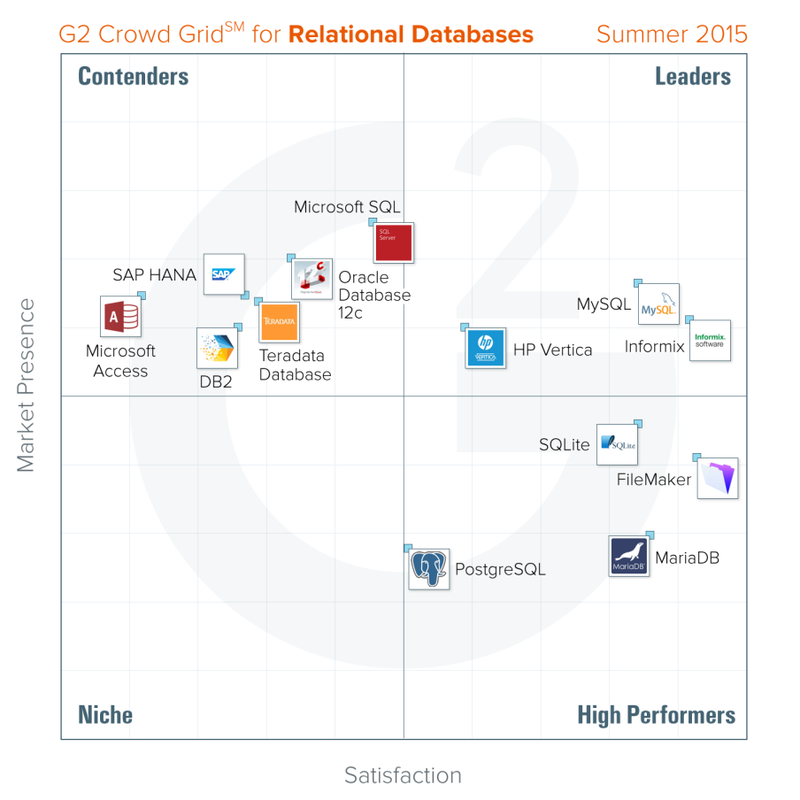 In G2 Crowd’s first GridSM Report on Relational Databases, over 300 reviews from database administrators, developers, and users were included to compose a comprehensive audit of the RDBMS market as it stands today. We found that despite the long history of relational database products users are unimpressed or apprehensive about the future of their RDBMS tools. Specifically, when asked if their product was headed in the right direction, users responded with an average of 76% satisfaction across all the products in the report. This is a markedly lower average than is usually seen in our reports. Ten of the thirteen RDBMS products received a rating in the 59% to 85% range for this metric. Perhaps the NoSQL “game-changer” has database enthusiasts yearning for Big Data scalability or schema-less flexibility for their current relational solutions, or maybe users would just like to see more feature development—even if the technology has been refined since the seventies. And, RDBMS vendors are responding to these requests, but it is difficult to nail down which moves are satisfying the user base. The three products in our report whose futures were rated with confidence by reviewers could not be more different. FileMaker (94% roadmap satisfaction) is a desktop database and application platform—not useful for data that scales beyond the capacity of your MacBook.MariaDB (100%) is an open-source, drop-in MySQL replacement—a fork of that mid- to high-level product after MySQL was acquired by Oracle. And, Teradata (91%) develops large-scale, enterprise solutions for companies like financial institutions. What is clear is RDBMS are not fading. Relational data is increasing at a faster rate than unstructured data. RDBMS users, however, are not confident that their tools will keep pace.